Identification: This dorid has a notum covered with a network of granular ridges as well as tentacular papillae. Both features are variably developed. When the ridges are strongly developed the spaces between them appear as dusky pits. Color ranges from cream to dusky violet and reddish-brown with variable amounts of white flecking. 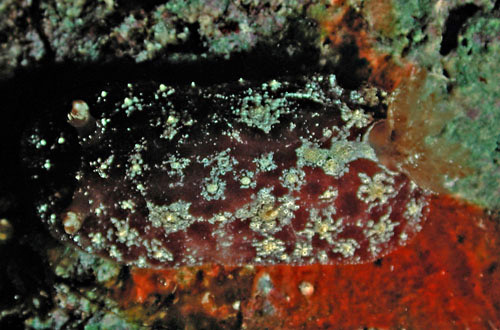 Nearly all animals have a short white band extending forward from the branchia and the rhinophores are reddish-brown to dark brown, variably tipped with cream markings. Young animals are typically smoother and may have marginal white spots. The branchia are light brown variably frosted with cream and the underside is marked with diffuse brown spots. Natural history: Thordisa albomacula is a moderately common species found in the low intertidal and subtidally to about 1.5 m (5 ft) at protected to moderately exposed rocky sites. Rarely, it occurs in Halimeda kanaloana beds at about 6 to 9 m (20 to 30 ft). Egg masses range from orange to pink (perhaps, depending on diet?) and hatch in four to five days in the laboratory. Distribution: Maui, Niihau and Midway: widely distributed in the western & central Pacific. Taxonomic notes: It was first recorded in Hawaii from Hekili Point, Maui by CP on May 5, 1993. Given the amount of variation, there's some chance that we may be lumping more than one species under the name. Photo: Terry Gosliner: tentacular papillae retracted: Midway; June, 1993.